Safety Week is coming! May 3-9, 2015 is earmarked for the second annual US Industry Safety Week, with a single goal to inspire everyone..
A variety of industries use synthetic slings to move equipment and product on a daily basis. Like most other sling types, synthetic web slings and synthetic roundslings serve to help provide..
A special condition arises when lifting a load whose pick points are not on the same elevation. 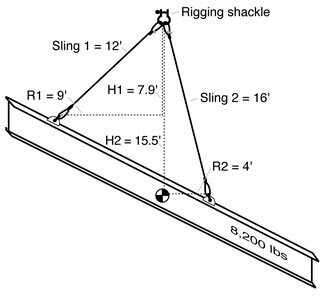 In determining the slings and rigging hardware necessary for the lift, the rigging planner needs to..
Estimating a load's approximate weight is always an important part of any rigger's checklist and must be done before choosing the rigging system. 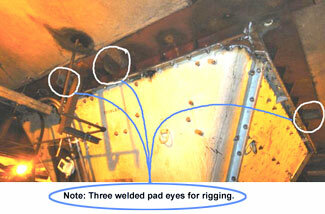 In this issue of the Professional Rigger, let's evaluate an accident. Read the case study below and identify the improper practices based on the list given. Answers provided at the bottom.Runaway..
A fairly simple method to upright a load is to lift with a crane while moving horizontally. In our March 1996 Issue, we discussed the use of a step block to help avoid "flop-over" or shock load..